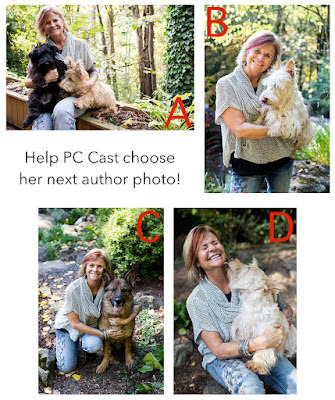 PC's Blog: Help choose my new author photo! Hope we could help you a little. PC!!!!! I love all of your photos and will go vote! PLEASE PLEASE PLEASE PLEASE give me more Partholon!! It truly speaks to my soul and I have cried at every book! I love Elphame and Lochlan, I love Cuchlainn and Brighid, Etain and Midhir are other worldly. Shannon and ClanFintan make me swoon, Rhiannon was a healthy reminder that we all choose our own path, and Clint a true hero! I am so glad Epona brought Kegan back to Oklahoma with Morrigan and I'd love to see how she brings the Goddess to the modern world! But most of all THANK YOU for presenting literature with Epona in it! You have helped my patron Goddess find my soul and I can't express how thankful I am for it. Although all the pictures are expressive in their own unique ways, I feel "C" is the best for your cover and this story line. 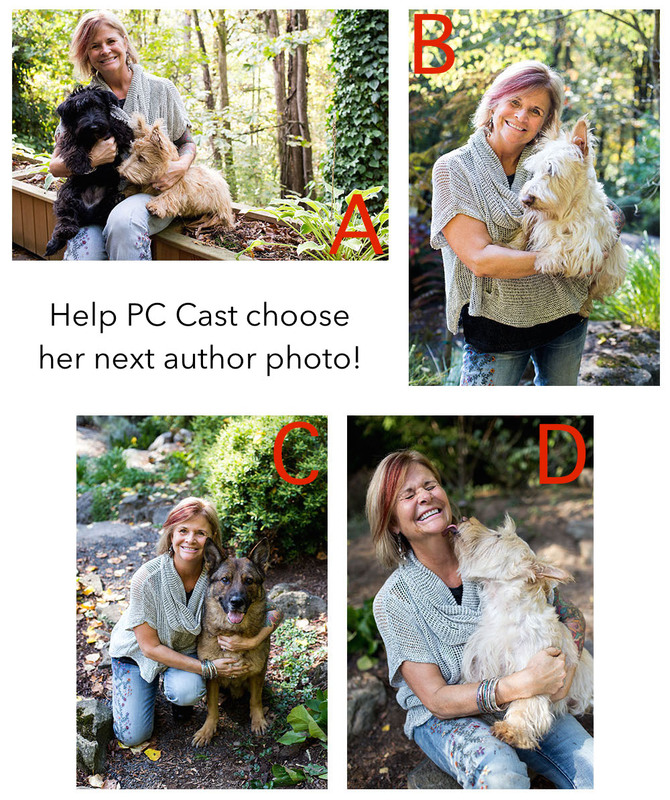 The "C" photo has great lighting, is well balanced with the size of the dog and his dark tones bring an exciting drama to you both as a unit. Having both of you looking directly into the camera gives an immediate connection to the reader, which I feel is the whole purpose of the Author Bio. Love your books! Excited for your new adventure! Kerrie Toner - I agree with you, and C is the one I expected most fans to choose, but I was surprised! The composition of the one you liked best is wonderful - it's the realism of the caught-in-the-act picture so many people liked. Addison Culp - thank you for your lovely comment! Partholon is my favorite of all of my worlds - with the exception of my new fantasy series. I would LOVE to write more novels set in Partholon (I've had Ciara's Destiny outlined for years), but because I write for a living I have to write what my publishers ask me to write, and Harlequin hasn't asked me to write any more Partholon books. Fans can change that, though! If enough fans contact Harlequin (through their website or FB), they'll be interested in contracting me for more Partholon books. Until then, I think you'll love my new fantasy world. The first book, MOON CHOSEN, will be released in October, and worth the wait! Promise!